Thank God for Shout Select. Their resurrection of Three O’Clock High, the very apex of cinematic psychological fear and terror when it comes to High School flicks, is to be worshipped. John Hughes did great things for teenagers in the 1980s but, when it comes to physical fights and the fear therein, there is no other film to EVER present it as realistic and as funny as here in this flick. And now it is back in action; Tangerine Dream and all. Jerry Mitchell (Casey Siemaszko) is not having a good day. He’s late to school. His car has a flat tire. And he does not impress the female object of his attention and, due to a rather awkward run-in inside the boys’ bathroom, he winds up challenged to fight the bully of the school, Richard Tyson's Buddy Revell, at the end of the school day. The opening shot in which an inverted camera gets flipped up on its end as Jerry wakes up late for his morning duty at the supply store in the High School is our first indication that this film is not going to be like the others. With quick edits and skilled camerawork, the film continues to challenge us with situations that feel oh so very realistic as Jerry, through a series of unfortunate coincidences, winds up drying his wet shirt in the microwave alongside his pop tart. "The point of discovering a movie as rich and on point as this one is that, once again, the critics shat all over the wrong movie. This is a classic comedy that never once disappoints." Yes, it’s “going to be one of those days” for this sad sack of a high school student. And there’s no stopping this brutal progression as each ticking minute brings him closer to his demise. His kid sister, Brei (Stacey Glick), can’t help but remind him of the day’s terrible events and his friends – Frannie (Anne Ryan) and Vince (Jonathan Wise) – try to help as best they can, but, by 10 in the morning, the main complication already has multiple complications. And he’s in the principal’s office. Like I said, the dude REALLY can’t win. And things only get worse for him. THERE IS NO ESCAPE. This is the mantra throughout this dark comedy that sees one high school outsider accidentally offending the new school bully and having to face the daily struggled of school in real time. Uh-oh, Spaghetti-o's. Expertly filmed with awesome angles and cool edits, Three O’Clock High is a comedy that remains underappreciated. I have a feeling that is about to change with this release. 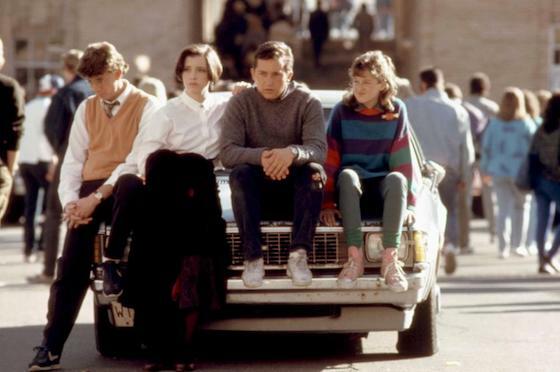 Directed by Phil Joanou and written by Richard Christian Matheson (son of horror guru Richard Matheson) and Thomas E. Szollosi, Three O’Clock High is one of the smartest teen films I’ve seen in a long, long while. This flick stands right alongside Evil Dead 2 when it comes to its use of a very expressionistic lens. Seriously. And the performance from Siemaszko is damned impressive in its ability to create humor and empathy. There are other seriously memorable performances throughout the film, too. From Jeffrey Tambor as one of Jerry’s teachers, Phillip Baker Hall as a cop, and Mitch Pileggi as a mean-spirited High School security guard, the film is loaded with awesome character actors who add a nice layer of bizarreness AND depth to the proceedings. Somehow Jerry has to get out of this dilemma. Tangerine Dream, who nail the mood and the darkly comic attitude of the film with a series of great compositions, also scores the film, keeping up the spirit of the 1980’s with a mixture of guitars and synths that feel so natural to the events unfolding on the screen that it becomes one with the movie. Three O’Clock High is a teenage-themed film that neither humiliates nor chastises its audience. Its darkness in theme as it walks through the halls of this school is accurate and so is its treatment of school gossip, proving to be both artfully handled as the new kid is believed to be the biggest thug of them all and, as the entire school takes bets on his stitches, the results are quite funny. The point of discovering a movie as rich and on point as this one is that, once again, the critics shat all over the wrong movie. This is a classic comedy that never once disappoints. It’s absolutely perfect. Let’s get that out of the way. It’s the forgotten wannabe John Hughes film that, thankfully, Shout Select has rescued from the DVD bargain bin and dusted off with a new HD scan, new interviews with the crew, and a new commentary. Three O’Clock High is made brand new again. Tagline: When school's over, it's all over. Memorable Movie Quote: "Pain is temporary, film is forever." Synopsis: The new kid, Buddy Revell (Richard Tyson, Kindergarten Cop), is rumored to have a violent history and Jerry Mitchell (Casey Siemaszko, Young Guns) has been tasked with getting to the bottom of it for the school paper. Desperate to get out of writing the story, Jerry accidentally angers Buddy and earns himself a date with Buddy's fists later that day. Can Jerry escape his parking lot date with destiny? Find out at Three O'Clock High. Offered courtesy of Shout Select in 1.85:1, the AVC-encoded 1080p transfer is a relative goldmine of previously unseen details and colors. This is EASILY the best the film has ever (and probably will) looked. The details in the classrooms and the surrounding exteriors are strong. The clothing is a reason to appreciate the visual “pop” throughout the high definition transfer, too. The atmosphere is especially nice. The crisp image quality is the best you’re going to get with a film like this and, admittedly, even a bit better than expected. Some stuff from the same era hasn’t made the HD transition quite as well, but skin tones look much, much better than expected. Colors are perfect. Blacks are solid. Skin tones are detailed and appropriate. A DTS-HD Master Audio 2.0 track provides the sound. There is a new audio commentary with director Phil Joanou. Shout Select provides this release with new interviews with Phil Joanou, screenwriters Richard Christian Matheson and Tom Szollosi, and a new interview with costume designer Jane Ruhm. Fans of this film will be pumped to see this appreciation to a classic film.